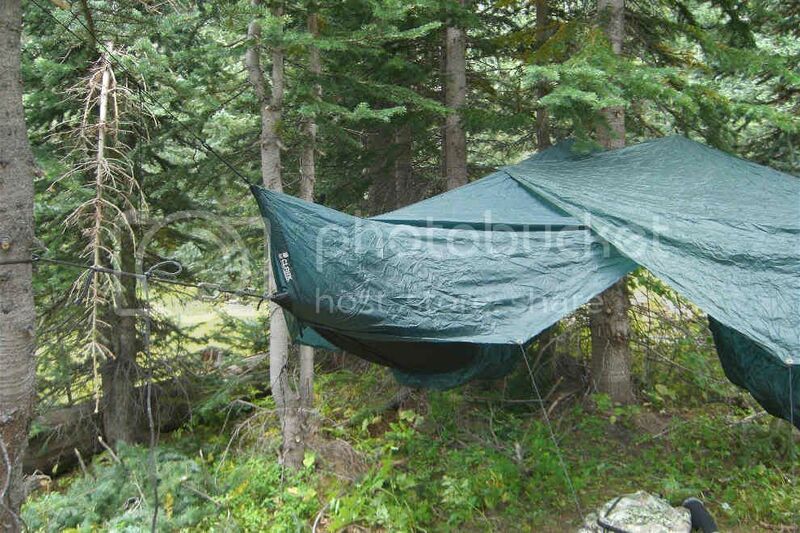 I've been using a Clark Jungle hammock for a few years now and just found this forum, so I'd like to say hello. 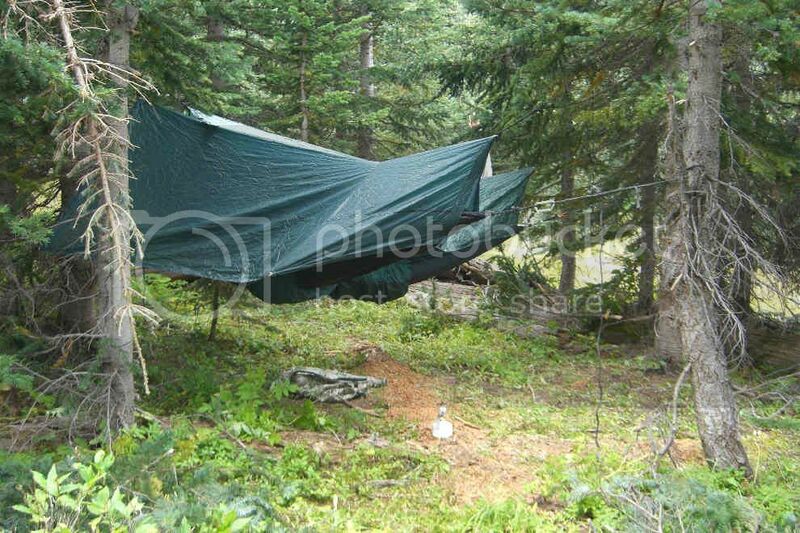 I mainly use my hammock while spike camping in Colorado while trying to find elk in September. Anyway, like most peeps, I'm not a huge fan of tieing bowline knots to a tree for my suspension system. That dang 2nd bowline is a PITA to get done in the dark! I had removed the polypro lines and used caribeeners and climbing rope with a prussic hitch for a year or two, but found that the climbing rope was unecessairly heavy and bulky. 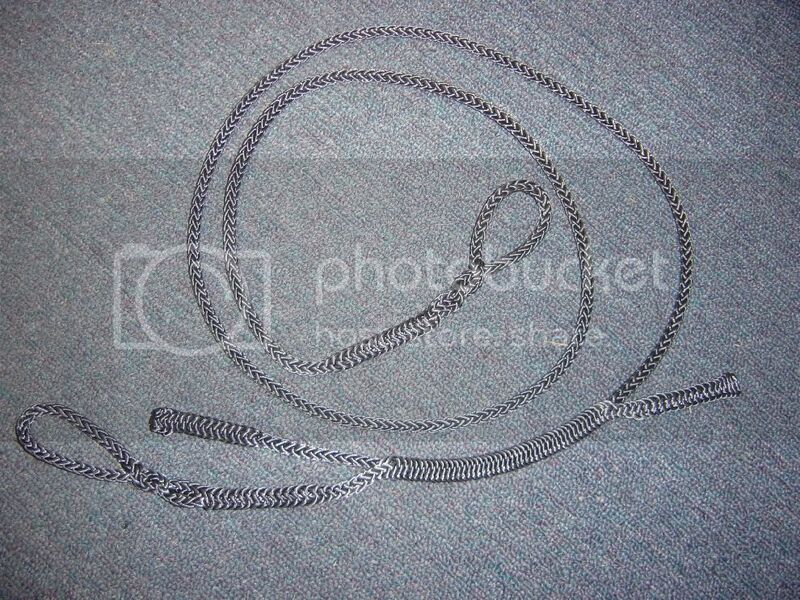 In the winter of 2007, I started toying around with constriction ropes and how to make them. (I was working on an invention for tree climbing sticks... and needed something to attach them to a tree with) What I came up with was something that I call a UCR (short for Utility Constrictor Rope). I was able to modify my Clark to use the UCR's (still using a beeners) and I gotta say, it's almost as light as it was with the original polypro ropes (yuch) and each end attaches to the tree in about less than 10 seconds. Here is a picture of one of our skipe camps in Colorado. Here is a picture of the rigging using my UCR's (behind my house in NC). Best first post ever...welcome to the forum! I think your method is a good one. The only drawback might be that it uses rope against the tree, rather than a webbing wrap. At least it is wider diameter rope. Tree huggers/straps should always be used, though. But I like it. Last edited by fin; 06-15-2009 at 09:29. This is very similar to a Whoopie Sling. Check the Samson Ropes splicing instructions for a Whoopie Sling from 12 strand rope. Scroll down to 12 strand rope and look for the Whoopie Sling. Similar, but quite different than a whoopie sling. A whoopie is one piece of rope, this is two seperate pieces of rope. The smallest whoopie sling that I could find was 1/2" material... that's WAAAYYY too big for this application. The UCR's are made of 1/4" 12-strand hollow core rope with a tensile rating of 3200 lbs. 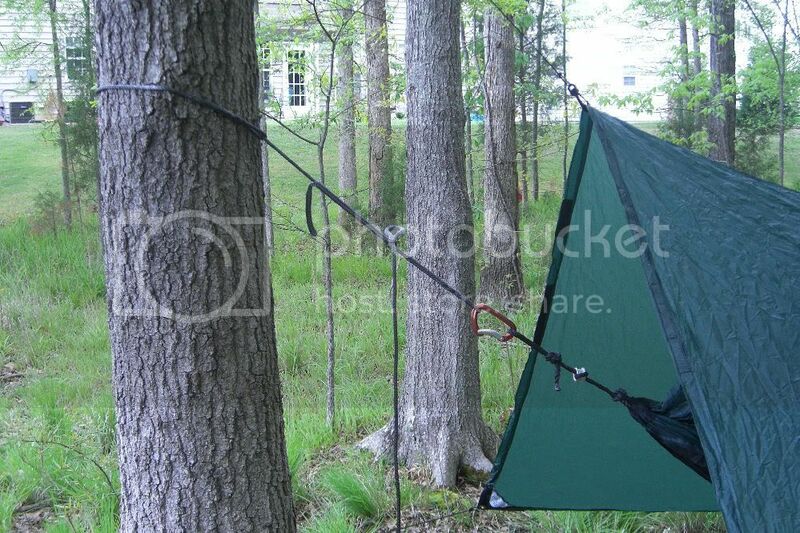 I would also encourage the use of webbing tree huggers to protect the back of the tree. 1/4" rope is pretty small stuff and can cut the bark or seriously compress the cambria underbark. Both are not the best scenarios. I would love to get my hands on a pair or even two pairs of these and mod them to be more treegentle.. where can I get them? Also, can you explain the actual connection to me. It looks as if you are using the one end like straps around the tree, but the end to the carabiner is what has me confused. Is it tied under the loop, to the loop, or is the loop in your last picture not the same loop as the one in the end of the UCR. That's the end that has me confused. What if you just had a foot or two of webbing that was tubular and could slide this inside the webbing? I wonder if that would help distribute the load to the backside of the tree. Very cool idea! I'd made some eye splices like that in 7/64 Amsteel for a toggled connection to the tree strap. This looks like the missing puzzle piece I've been subconsciously seeking. Thanks for posting this, and welcome aboard! It looks like you have a slipped half-hitch on the rope. Is the half-hitch there because you experienced slippage?? Or is it there because you just feel safer with it?? If because of slippage, would increasing the length of the buried portion increase the holding power enough to make the half-hitch un-necessary? What is the length of your buried portion? For the Whoopie Sling, Samson Ropes recommends that the buried portion be equal to 3 1/2 fids, so for your 1/4" diameter rope, they recommend the buried portion be 18 3/8". It is hard to tell from your pictures the length of the buried portion. 1st hammock, local stores ropes, webbing? ?